The self-proclaimed King Of Power Pop, Paul Collins is one of the most enduring cult rockers of the late 70s and a founding member of the legendary Nerves (with Jack Lee and Peter Case). He started his solo career in 1979 and has released more than 11 studio albums as Paul Collins, or Paul Collins Beat. Out Of My Head, his first new record since 2014s Feel The Noise, is a return to the pure, unadulterated sound he helped create in his youth. On this new album Paul not only sings, but plays all the drums and most of the guitars as well. With the collaboration of Paul Stingo on bass and harmonies, he delivers a true rock n roll record of the kind that are not being made in todays world: simple melodies with classic songwriting structure, Rickenbacker guitars drenched in juicy reverb, straight up 60s pop harmonies, and groovy drums, all recorded reel to reel, by real players. The result is a testament to one mans undying love for rock n roll. 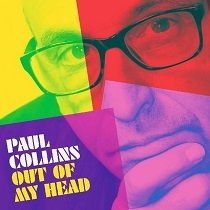 Paul Collins never ceases to amaze me. No matter how old he gets, he never gets old. Out of My Head is nothing less than a testament to one mans undying love for rock n roll. He has the same unbridled enthusiasm for playing melodic power pop that he had when he started almost 40 years ago. Most importantly, he hasnt lost his touch for writing a killer hook. The appropriately titled Go has the same motor that one might have expected from a Paul Collins song circa 1980. Midnight Special has a similar charm. Youll find yourself singing aloud to Kind of Girl. Thanks in part to its hand claps and harmonies, Just Too Bad Youre Leaving is a candidate for first single on an album thats chock full of em. Things slow down with Emily, an Everly Brothers style tune that is no less satisfying than its more up tempo counterparts. And You Belong to Me is power pop the way God intended it. No frills, all hook and no filler!  PowerPopNews.com EXCELLENT! !